Our vision for the Doctoral Internship in Psychology is to develop health service psychologists with the conceptual and clinical competencies necessary to deliver psychological services in a manner that is effective and responsive to individual and societal needs, both now and in the future. The underlying philosophy for the training program is a Practitioner-Scholar model that integrates theory, research, and clinical practice to help interns develop as strong generalist practitioners. Furthermore, we believe that sensitivity to individual differences and cultures in a diverse society and openness to self-reflection and life-long learning are necessary to bring these all together. As part of this model, we believe the development of reflective skills and self-examination are essential, for trainers and trainees alike. Together we will focus on building supervisory and training relationships that self-examine and continually reflect on, discuss, and explore ways to grow and meet the needs of the trainee more effectively. We will emphasis internship learning as a relational and reciprocal process, with an emphasis on the process versus the content of learning and valuing the use of self and creativity. Interns will be trained in an empirically-based and self-reflective clinical practice to gather information from clients, reflect upon and evaluate the process and outcome of their interventions, and plan future interventions based upon an integration of this experience. To accomplish this goal, psychological theory and research will be incorporated with supervised clinical experiences and self-reflective learning. Supplementary learning methods will include didactic presentations, skill-building seminars, small group discussions, behavioral rehearsal and modeling, and consultative guidance. In this manner interns shall explore both the self-awareness/self-reflection part of a therapeutic alliance and the ways they express these parts of themselves in skills and techniques. Answering these questions, on a continual basis is vital to the process of becoming a therapist and a psychologist. By focusing our training on the concept of “Use of Self” we are able to integrate interventions with the personhood of the therapist. By this we mean that in assisting the trainee in exploring and understanding the qualities and dynamics that he or she brings to each interpersonal encounter and how these facilitate or hinder effective interactions the intern will grow as a therapist. The intern will be encouraged to become more attuned to his or her thoughts and feelings in working with clients, and recognize how this increased self-awareness can be used to better understand client dynamics and develop effective treatment strategies. We believe in the working alliance as an indispensable ingredient in any helping relationship, and therefore we encourage trainees to recognize, improve and employ those personal qualities that will assist in forming effective working relationships with clients, peer, center staff, and other members of the university community. Our training activities ask interns to appropriately disclose personal information such as reactions to experiences they are having with a client, within supervision, or in another training activity. Our training staff take very seriously their responsibility to foster and maintain a safe, trusting, and supportive environment that will allow such disclosures to occur in accordance with the goals and objectives of our training model. Interns have full discretion over the personal information that they disclose within the training process. Training and supervision do not occur unilaterally or in a vacuum, but in the context of layered relationships (with power differentials) that are also full of cultural diversity and complexity. This can enrich the experience and create a growth producing dyad. In this dyad, all parties are balancing the same human needs for both connection and safety. With an intentional focus on the process and repairing ruptures individuals can move in and out of connection with each other in a relational dance that produces personal and professional change for the trainee – as well as for the trainer. Relational-Cultural Theory (RCT) offers a useful conceptual model for understanding the relational dimension of psychotherapy and supervision. When established as a central focus of supervision, the supervisory relationship can form the very crucible in which trainees learn how to become therapeutic. This relational learning can empower both supervisee and supervisor. We are committed to prioritizing the training needs of the Interns. Intern caseloads are built gradually and thoughtfully. Interns’ initial clients are all assessed to be presenting without high risk factors by a senior staff member. Intern caseloads are consistently monitored to ensure appropriate clinical loads. Interns see walk-in and intake clients only after receiving specific training through didactic seminars and skills assessment via live supervisor observations. Interns initially shadow supervisors and then are shadowed by supervisors for two or more appointments before conducting them independently. Clinical staff are accessible for mid-session consultations. Interns are instructed to consult with a supervisor mid-session when specific risk factors are present. Interns record all their sessions for supervision purposes. Clients who do not consent to recording are usually transferred to senior staff members. When providing group therapy, interns are initially paired with senior staff co-leaders. Interns receive seminars prioritizing their professional development and growth. Interns meet regularly with the Training Director to discuss any questions or concerns about the program. Program training requirements are maintained during times of high clinical demand for our agency. When necessary, we will reduce an intern’s caseload and/or increase weekly supervision to remain focused on the intern’s training and development. We offer a generalist training experience at a college counseling center that integrates science and practice throughout the program and trains future Health Service Psychologists to serve a diverse public. Our training is primarily experiential in nature. We value diversity and incorporate ways to build on cultural competency experiences throughout the program. We value a Relational Cultural model as a unifying philosophy for the change and growth process in supervision. We incorporate a use-of-self approach and interns explore the two training questions; 1) who am I as a therapist? And, 2) what are the ways I am therapeutic? We will incorporate ethical discussion and decision-making throughout the program. We will provide ongoing assessment of skills with increasing levels of responsibility and independence. We strive for continuous improvement in our training approaches and will be asking for your input on a regular basis. – only on-call one week to every 4-7 weeks. A full-time, 2,000 Hour Internship Employment must be completed. 500 Direct Service Hours: Direct service includes individual, group, and couples counseling, crisis intervention, consultation with clients or concerned family members/staff/faculty, providing outreach services, providing supervision, leading a psycho-educational training to trainees or staff & conducting assessments. Successful Completion of Diversity Project: Intern will complete a diversity project, approved by the Multicultural Services Coordinator, meeting minimum competency ratings on the Diversity Project Rating Form. Successful Completion of Outreach Project: Intern will complete a residence hall outreach project, approved by the Outreach Coordinator and meet minimum competency ratings on the Outreach Project Rating Form. Intern Log of Hours: Interns will document the 2000 hour internship and direct service requirements. Co-Facilitation of a Group with a Senior Staff Member: At a minimum, interns are required to co-facilitate at least one group during their internship year. Successful Attainment of Minimum Thresholds for Identified Competencies: as measured by Intern Evaluation Form. Complete all written records and reports (including progress notes, assessment reports, intern logs, intern project summary, etc.). Complete all required evaluations of supervisors and the training program. Attend and participate in Texas Intern Conference. Submit presentation/workshop proposal to Texas University & College Counseling Centers Conference: Attend and present if accepted. Participate fully in all Clinical, Diversity, and Professional Development Seminars. Participate fully in preparation and training of new practicum students in June and July, by working with Coordinator of Practicum Training. Participate fully on Intern Selection Committee. Meet Minimum Levels of Achievement (MLA’s) for Capstone Professional Case Presentations. Meet Minimum Levels of Achievement (MLA’s) for Capstone Professional Workshop Trainings. Interns see up to 16 individual clients per week. The Baylor Counseling Center functions primarily within a short-term counseling model. Interns will have the option of seeing 2 clients over a longer period for the training experience of doing some in-depth clinical work. This will be determined in a discussion with their primary supervisor. The Counseling Center offers a variety of groups throughout the year. Examples include Mindfulness, Boundaries, Substance Abuse, Men’s, Sexual Assault Survivors, Creative Arts Process, Social Confidence, Adult Children of Alcoholic Families, Interpersonal Process, etc… Interns are required to co-lead at least one group with a staff member and then may develop and lead groups in their own areas of interest. Students who are coming to the Baylor Counseling Center for the first time are asked to attend an initial consultation session as a way of entering the system – called an Initial Assessment, accessed through our Walk-In Clinic. The therapist on initial assessment duty then conducts a 30-minute assessment interview. Interns will each cover 2-4 hours weekly of the walk-in clinic time. Counselors may also see crises during this time as it serves as our entry point for all types of concern. Consultation Services: The Counseling Center staff offers strategies for connecting a student with the Counseling Center or another support service. “Let’s Talk”: Let’s Talk is a confidential drop in consultation service for Baylor students that takes place during set hours in various locations on campus. Workshops: The Counseling Center provides various workshops to address issues that college students often experience. Therapist Assisted Online (TAO): This model of therapy is based on online interactive modules that provide skills and strategies a student can practice during the week while a counselor monitors progress and meets with the student weekly through a secure video conferencing tool. The Baylor Counseling Center provides formal after-hours emergency services. Staff, interns, and practicum students all provide this coverage on a rotating basis for a week at a time. Interns will be the first contact by phone, with senior staff serving as support, supervisors, and back up for the next line of phone contact. After-hours on-call coverage is done by phone. Therapists assess the concern and provide appropriate interventions. 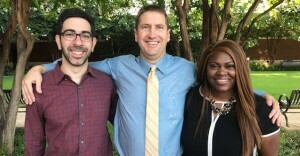 The Baylor Counseling Center provides practicum experience for doctoral graduate students in clinical psychology from the Baylor University Psy.D. Program in the Department of Psychology and Neuroscience. Interns provided this supervision experience, first co-supervising with senior staff and then gradually providing more and more of the supervision on their own. As part of their supervisory duties, interns are responsible for both the client care and the professional development of the practicum student. This will include reviewing videotapes and/or observing therapy sessions. Interns as supervisors are also responsible for reviewing all practicum trainee case notes. Practicum supervision by each intern is supervised in the Supervision of Supervision Seminar and 2) through the Co-Supervision Model. Strong supervision is a highlight of our training program and we believe it to be the most essential element of what we offer. Each intern receives 2 hours per week of regularly scheduled supervision from a licensed psychologist. Additional unscheduled supervision and consultation with the supervisor and other staff members are available and encouraged. Although individual supervision may focus primarily on an intern’s counseling cases, diversity, ethics and other professional issues are valuable parts of these discussions. During the training year, interns will co-lead a group with a staff member. This co-leader serves as the supervisor for the intern’s group therapy activities, meeting for approximately one half hour immediately preceding and/or following each group session. This supervision provides interns the opportunity to discuss dynamics, content and interventions specific to the group they are co-leading, as well as discuss group therapy dynamics and interventions in general. Once an intern has co-led a group with a staff member, he/she may be able to co-lead a group with another intern or independently lead a group, under supervision. This weekly meeting combines a supervision training seminar with group supervision of practicum students. The seminar meets for 2.0 hours each week and focuses on developing supervisory skills. Topics for the didactic portion of the seminar include supervision models, supervisory roles and process, ethics, cross-cultural supervision, etc. Supervision of Supervision provides interns a setting in which to share and discuss their experiences as supervisors, and will be facilitated by the Training Director. Interns will meet together with clinical staff members for 1.0 hours each week to watch video and discuss in detail one or more clients/cases. The Case Consultation will be facilitated by the Training Director and will involve writing a conceptualization, researching a relevant journal article, and sharing video footage for discussion. Interns will each have a 6 week opportunity each semester to share video of the same client, weekly, with a small group of clinical staff, exploring the clinical work with an emphasis on multicultural counseling and attention to issues of diversity. The Diversity Seminar will meet, at a minimum, for an average of 2 hours every other week, and combine didactic with experiential and discussion activities on topics related to diversity and developing cultural humility and multicultural competencies. Some weeks this seminar may be replaced by special opportunities such as a visiting presenter, outside workshops on diversity, or attending a conference. Interns will develop and present their own diversity seminars on topics of their choice during the late spring and summer, as a capstone training experience for this seminar. These may be a part of training incoming practicum students. The Didactic Training Seminar is an educational seminar that provides interns with training and information about a variety of professional issues and topics of therapeutic relevance. This is a 2 hour weekly seminar presented by Baylor Counseling Center staff, other Baylor University faculty and staff, and professionals from the surrounding community. Some weeks, this seminar may be replaced by a special opportunity such as an outside presenter or attending a conference or workshop. Interns are required to develop and present their own seminars on topics of their choice during the summer as a capstone training experience. The Professional Development Seminar is an educational/experiential opportunity that provides interns with training, information, and experiences to wrap up their training year as and integrate their learning. These will occur throughout the months of June and July, and might include topics about career opportunities, job search, work/life balance, etc… It will also include providing professional presentations themselves in the areas of diversity, clinical topics, case presentation, and theory of change. Training incoming practicum students will also be a part of these experiential learning opportunities. Baylor Counseling Center staff is frequently asked to consult with faculty/staff, friends, or family members about a specific student or situation, to provide staff development programs for other departments, present seminars or workshops for student groups, and provide other outreach services on campus. Senior staff members invite interns to co-present workshops during the fall semester to assist the intern in gaining experience in making presentations. Interns also participate in general outreach activities. Interns will be expected to contribute to the mission of the BUCC by assisting with outreach efforts throughout the academic year. This may include tabling at campus events, promoting BUCC services, providing training for students or faculty/staff on mental health topics and engaging in afterhours outreach events. There is also an individualized Outreach Project required that the intern collaborates on with the Outreach Coordinator. The Outreach Coordinator will provide supervision and support but the intern is expected to show initiative and responsibility for the project. The Outreach Coordinator provides a biannual evaluation of the intern’s development of this competency, as well as yearlong consultation and support. The interns will discuss their developmental stage of diversity awareness and cross-cultural competency with the Coordinator of Multicultural Services, and together they will develop a year-long training plan that includes both a diversity project and core experiential components and activities. The Coordinator provides a biannual evaluation of the intern’s development of this competency, as well as year-long consultation and support. We are highly invested in the education, prevention, support, and appropriate treatment for students in the areas of interpersonal violence education, prevention, and intervention. Interns may engage in experiences that support the mission and work of the counseling center on campus in this area, as appropriate and as available. Readiness for these activities may be evaluated by the Assistant Director of Trauma Recovery, psychologist Dr. Cheryl Wooten, who will be glad to talk through your interests in this area. We are highly invested in the education, prevention, support, and appropriate treatment for students in the areas of addictive behaviors. We have specialists in this area that can provide valuable learning opportunities for interns. Interns may engage in experiences that support the mission and work of the counseling center on campus in this area, as appropriate and as available. Dr. Don Arterburn, LMFT and Kathleen Haas, LCSW, MA Ed, CADC will be glad to talk through your interests in this area with you. We are highly invested in the education, prevention, support, and appropriate treatment for students with disordered eating. We have a specialist in this area that can provide valuable learning opportunities for interns. Interns may engage in experiences that support the mission and work of the counseling center on campus in this area, as appropriate and as available. Erin McGinty, LPC, will be glad to talk through your interests in this area with you. Training interns to become skilled clinical supervisors is a highlight of our training program. We use a Relational Cultural approach within a co-supervision model with the Training Director mentoring and empowering interns to hone their skills of being a supervisor. They will meet weekly with their practicum supervisee, participate in a 2 hour weekly supervision-of-supervision, and provide consultation in the weekly practicum case conference.